It's All In Your Head: Ch..Ch..Changes! It is easy to be the person you have always been for it requires no change, no self-reflection and no growth. It may appear that changing yourself requires giving up something. In reality, there is no need to give up anything. You must simply add to what has been. I love this bit of wisdom. We often look at change as giving up something and replacing it with something else. We try for a while and then revert back to what we know best. 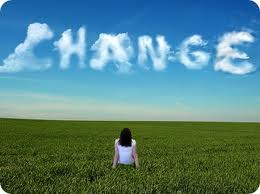 Perhaps shifting our paradigm and looking at change as adding to who we are would make changing easier. When we look through new eyes, things become clear.